A player’s ball lies on the apron of the putting green and there is a sprinkler head on their intended line of putt. May they take relief from the sprinkler head? So ladies now we have seen the picture, read the local Rule what does this means to us and what do we do? 1. We see from the picture that the sprinkler head is directly on our line of putt and the ball is within two club lengths of the sprinkler head. This means that we can, if we want, use the local Rule that Discovery Bay is putting on our score card. 2. You may drop your ball within one club-length of the nearest point of relief, not nearer the hole, the ball may be cleaned when lifted under this Rule but how do we do this? 3. a) First do not pick up your ball until you are SURE you want to take relief. Once you have pick it up you cannot change your mind. c) You should take your putter; take an address position where there is no interference from the sprinkler head. The nearest point of relief is where the club head is grounded and is the closest spot in play, no nearer the hole, free from the obstruction. At this point, the specific spot on the course has been determined. d) You should mark this spot with a tee and you may now get the longest club out of your bag to measure the one club length. Mark the club length with a second tee. 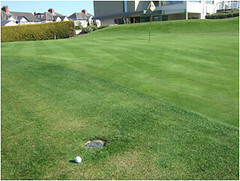 e) If you are sure you want to proceed pick up your ball, and drop it within that club length you have marked Once you drop the ball and the ball hits the course within the measured one club length and does not move closer to the hole, or does not roll more than two club lengths your ball is in play. f) If the ball rolls closer to the hole, more than two club lengths or there is still interference you have to do it all over again. After two attempts you may place the ball where it first hit the course as long as it is within the club length you measured and not closer to the hole. You may not choose the nicest point of relief; you may only drop within a club-length of the nearest point of relief, not nearer the hole. For this reason you should always determine where the nearest point is before you lift your ball, in case it happens to be in a position that is even more unfavorable than your current lie. Here is the “Official” announcement from the USGA re anchored strokes and the use of belly putters. It will not be in effect until 2016 when the new edition of the Rules book is published. You will all go “belly up” after then! Ha! See the USGA announcement below. Far Hills, N.J., USA and St Andrews, Scotland (May 21, 2013) – The United States Golf Association (USGA) and The R&A, golf’s governing bodies, today announced the adoption of Rule 14-1b of the Rules of Golf that prohibits anchoring the club in making a stroke. The new Rule will take effect on January 1, 2016, in accordance with the regular four-year cycle for changes to the Rules of Golf. For more information about the adopted Rule, including a demonstration video, photos, infographics, and a Guidance Document for Players and Officials, visit www.usga.org/anchoring or www.RandA.org/anchoring. R&A Rules Ltd is the rules-making company of The R&A. Based in St Andrews, The R&A organises The Open Championship, major amateur events and international matches. Together with the United States Golf Association, The R&A governs the game worldwide, jointly administering the Rules of Golf, Rules of Amateur Status, Equipment Standards and World Amateur Golf Rankings. The R&A’s working jurisdiction is global, excluding the United States and Mexico. C 2013 United States Golf Association. All Rights Reserved. If you would rather not receive future communications from United States Golf Association, let us know by clicking here. Here are the results for the Spring Handicap Tournament. Thanks again to all the ladies that participated. OVERALL SPRING HANDICAP TOURNAMNET LOW NET WINNER IS…..
My apologizes to Shelly for incorrectly announcing the wrong 3rd place winner at the lunch today.